Flooding in Laramie County is typically caused by heavy thunderstorm activity which can occur from late spring through early fall. This type of thunderstorm was evidenced most recently on August 1, 1985. This storm event resulted in a 24-hour record rainfall, 12 deaths and $65 million in property damage with significant flooding along Dry Creek and Crow Creek. Flooding in the SFHA may consist of shallow ponding or overbank flooding and flood depths may exceed two (2) feet. This type of flooding can cause local drainage problems such as backed up sewers and storm sewers designed to drain streets and ponding in certain areas. In some cases, yard ponding will cause or aggravate basement flooding. Flooded streets and yards can cause or aggravate both health and safety issues and disrupt traffic. This map is based on the FEMA 100 year designation. The Laramie County Floodplain Map is in .pdf format. It can be printed on 36x48 size paper, using a large format printer, it is not recommended to print to smaller paper sizes and smaller printers. The map can be viewed, downloaded or printed from Adobe Acrobat Reader. If you do not have Acrobat Reader and wish to obtain it, this link will take you to the Adobe site. These maps have been distributed by FEMA and represent the most recent edition available. The United States Geological Service converted the maps to a form compatible for use in this website. Any FEMA approved changes to these maps, after the date displayed on each panel, may not be included in this presentation format. The Community Panel Number for Cheyenne is 560030 and for Laramie County it is 560029. The Laramie County Flood Insurance Rate Maps (FIRM) can be downloaded from the links below. The maps are in a PDF format and can be viewed in Adobe Reader. Please click here to get Adobe Reader. Note: These images may take a long time to download depending on the speed of the Internet connection you are using, because of the large file sizes.You can use the index map to determine which of the FIRM maps you want to download. This format represents all certificates that have been completed and filed with the Laramie County Planning Office since March 1, 2002. All Elevation Certificates are in .pdf format, and are designed to be printed on 8.5x11 size paper. If you do not have Acrobat Reader and wish to obtain it, this link will take you to the Adobe site. To download the current FEMA Elevation Certificate form, click here. Read about floodproofing and get more information from the Laramie County Library on the measures appropriate for your building. Check out flood insurance coverage. Read about the County's construction and dumping regulations. Follow these rules and report violoations to the Laramie County Planning Department at 633-4303. Floodproofing a structure means altering it so damage from floodwaters will be reduced or eliminated. Different floodproofing techniques are appropriate for various types of buildings. If you have a basement, split level or other floor below ground level, read the Homeowner's Guide to Retrofitting: Six Ways to Protect your house from Flooding (FEMA publication 312). This document can be read at the Laramie County Public Library, ordered (for free) from FEMA by calling 800-480-2520 or viewed and downloaded from the FEMA web site. If your structure is on a slab foundation, investigate a low floodwall, berm or "dry floodproofing" (i.e. making the walls watertight and closing all the openings when a flood occurs). If your structure were on a crawlspace, a low floodwall, berm or "wet floodproofing" would be a benefit. "Wet floodproofing" means moving all items subject to damage out of harm's way so water can flow into the crawlspace and not cause any problems. In addition, FEMA's recent publication, Protecting, Building Utilities From Flood Damage can be viewed or downloaded from the FEMA website. No matter what kind of building you have, some last minute emergency measures can always help. For example, you could move valuable items (i.e. photos, antiques) or items most damaged by floodwaters (i.e. upholstered furniture) up to a higher level. You can place sandbags or plastic sheeting in front of doorways and other low entry points. Whatever emergency protection measures you use, it is always best to have a plan written in advance to make sure you do not forget anything after the flood warning has been issued. Flood Insurance is highly recommended. Remember, even if the last storm or flood missed you or you have done something to protect your structure from water, the next flood could be worse. Most homeowner insurance policies do not cover a property for damage by floodwaters. Laramie County participates in the National Flood Insurance Program. Due to this, insurance agents can sell a flood insurance policy under rules and rates set by FEMA. Any agent can sell a policy and all agents must charge the same rates. 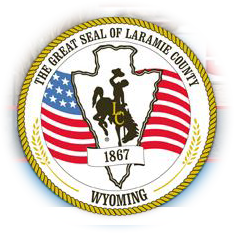 In addition, Laramie County participates in the Community Rating System Program through FEMA and has a class 8 rating. This rating allows all flood insurance policy holders to receive a 10% discount on the cost of their policy. Any home, even one that has experienced flooding, can be covered by flood insurance. Detached garages and accessory buildings are covered under the policy for the lots main structure. Separate coverage can be obtained for the contents of the structure. * Do not wait for the next flood to buy insurance protection. There is a 30-day waiting period before National Flood Insurance coverage takes effect. Contact your insurance agent for information on rates and types of coverage available. Do not walk through flowing water. Drowning is the number one cause of flood deaths. Currents can be deceptive with six inches of moving water capable of knocking down an individual off their feet. Use a pole or stick to help ensure before going through an area where the water is not flowing. Do not drive through a flooded area. More people drown in their automobiles than anywhere else. Don't drive around road barriers - the road or bridge may be washed out. Stay away from power lines and electical wires. The number two flood killer is electrocution as electrical current can travel through water. Report downed power lines to Xcel Engery at 800-895-1999. Be alert for gas leaks. Use a flashlight to inspect for damage. Do not smoke or use candles, lanterns, or an open flame unless you know the gas has been turned off and the area has been ventilated. If you smell gas odor call Xcel Energy at 800-895-2999. Clean everything that got wet. Typically floodwaters have picked up sewage and chemicals from roads, farms, factories and storage buildings. Spoiled food, flooded cosmetics and medicine can be health hazards. When in doubt, throw them out. Take good care of yourself. Recovering from a flood is a big job. It is tough on the body and spirit with the emotional effects possibly lasting for an extended period of time. Be alert for signs of anxiety, stress and fatigue. Additional flood safety information can be obtained at FEMA. Laramie County has established an early flood warning system. A system of gages will alert officials of raising waters along Dry Creek, Crow Creek, Spring Creek and in the Buffalo Ridge area. The gages are monitored by the National Weather Service and maintained by the United States Geological Service. In the event of a flood emergency, the National Weather Service will alert the weather radio service, 911 Dispatch Center and the Laramie County Emergency Management Department. Laramie County has established an outdoor warning system that is administered by the Laramie County Emergency Management Department. If sirens are activated, residents are encouraged to go into their homes and access a local affiliated Emergency Alert System (EAS) radio or television station to hear updated information and instruction. The current EAS radio stations are FM KQLF 97.9, KKPL 99.9, KOLZ 100.7, KING 101.9, KRRR 104.9, KLEN 106.3, KKAW 107.03 - AM KGAB 650, KRAE 1480 - and television stations KGWN (CBS) CH 5, KLWY (FOX) CH 10/27, AND KKTU (ABC) CH 8/33. You may visit the United States Geological Service to obtain streamflow information and real time data regarding stream flows impacting Laramie County.